Rome began the 4th century BC as no more than the leading city of a small league of Latin communities and ended it controlling all of Italy and on the doorstep to Western preeminence. 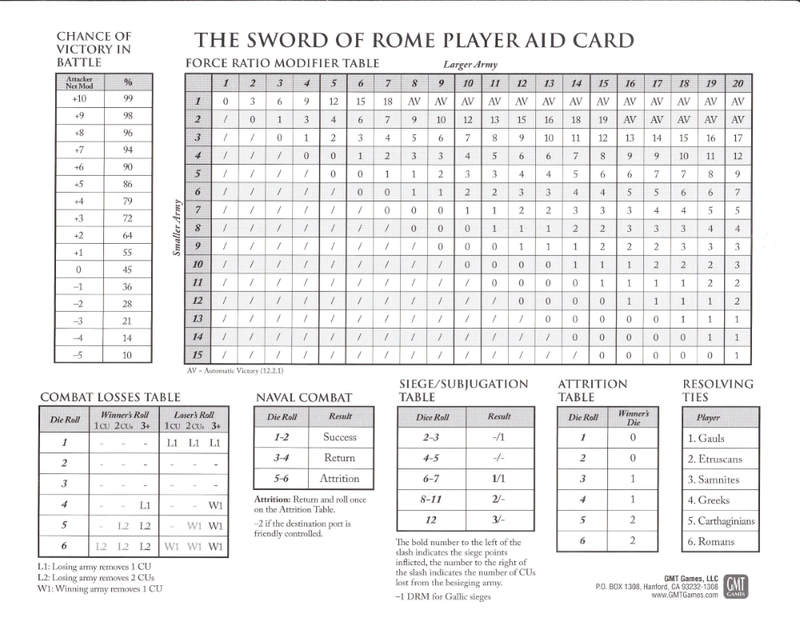 The Sword of Rome is the latest in GMT Games' acclaimed line of Card-Driven Games (CDG). 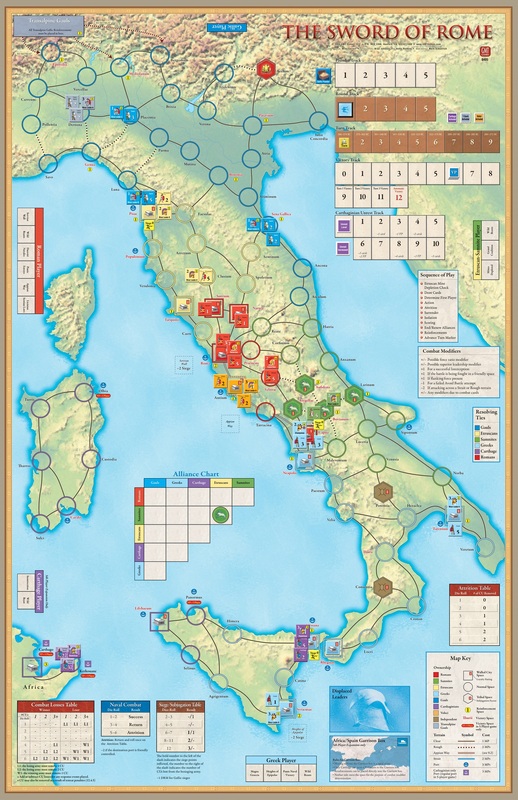 The game enables up to four players to recreate the climatic struggles among the peoples of Italy and Sicily, Romans, or Gauls will dominate the western Mediterranean and with it earn the right to vie for control of the known world? 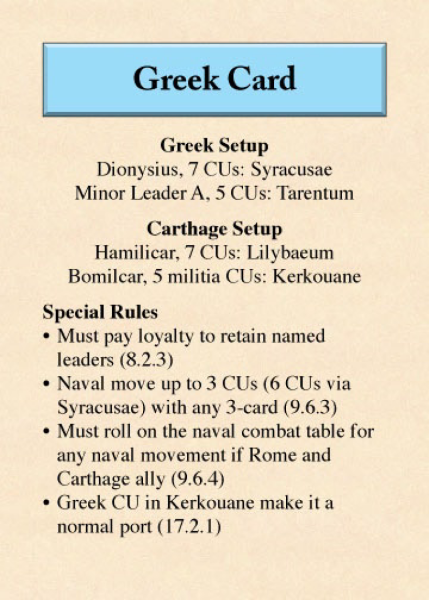 Through a unique adaptation of the event-card system, players can also take on the roles of additional contenders such as Gallic tribes from across the Alps or the mighty naval power of Carthage. You will command the great figures of the age: Rome's military savior Marcus Furius Camillus; Syracusan tyrant Agathocles, who dared to assault Carthage itself; or Pyrrhus of Epirus, the adventurer king who sought to unite the western Greeks. I'm looking for four brave souls to play this game. Due to the nature of Interceptions and Response cards, please be sure you can check in fairly often, especially if you're the Etruscan/Samnite player. Leaving me instructions is also acceptable. If you would like to play, please post your faction and whether you would like a long or short game in bold. The factions are: Gauls, Etruscan/Samnites, Greeks, Romans. The long game is three turns longer then the short game and is otherwise no different. Secret discussions between players is allowed by the game. If you do not have PMs, please post a way for the other players to contact you. I'll have a go if you aren't already full from the Wargames thread. The Etruscan and their Samnite pals for me, please, if someone wants them I'm fine with Asterix as well. No length preference. EDIT: PMs are fine for communications, otherwise shoot me an email to safatsamurai. It'ss a gmail address. I'll do the Greeks and personally would prefer short since this will be my first time playing this and odds are I will screw it up bad haha. PM are just fine for communication. First ine playing and other than a few hours a day I am open. though I have played quite some GMT Games previously. I've added a blank map to the second post. I'm also going to do a quick summary of the rules here, since everyone is new to the game. I'll point out the rules I think are most important, but I still encourage that the rulebook be read. Victory is determined by VPs in this game. VPs are awarded and lost by control of Victory Spaces, which are represented by the spaces whose names are in Red on the map. Importantly, Players gain a VP for each Victory Space they control that is outside their Home Area (those spaces that begin the game under their control). Conversely, they lose a VP for each Victory Space in their home are that they do not control. This is done near the end of each Turn during the Scoring Phase, so if a player can control an opponent's Victory Space for multiple turns, they will gain multiple VPs for it, and their opponent will lose multiple VPs. If a player reaches one of the Automatic Victory spaces, he will win at the end of the turn, otherwise, whoever has the most VPs at the end of the game wins. ALL ties are won according to the list in the second post, namely: Gauls, Etruscans, Samnites, Greeks, Romans. This includes any tie for winning the game. The Action Phase of a Turn is consists of five rounds. Starting with the First Player and then going down the tie break list, each player has an opportunity to play a card or pass. As in most CDGs, cards may be played for the event or for the cards value in Ops. They're not actually called Ops in the game, but Twilight Struggle has ruined me for calling it anything else. Ops may be used to replace an enemy Political Control (PC) Marker with your own or to increase loyalty of Cities you control. Enemy PC markers may be replaced wherever you have a CU. Cities have a max loyalty of three. Three Ops may be spent to receive a Combat Unit (CU) as a reinforcement. Ops may also be used to activate a Leader. Leaders require Ops equal to or greater then their Initiative to be activated. A Leader's Initiative is printed in the upper-left of their counter. Ops in excess of the Leader's initiative may not be spent elsewhere. For example, Dionysius may be activated with two or three Ops. If three Ops are used, the extra Op is simply wasted. Each player begins the game with two Desperate Times cards. Similar to Pivotel Events or Brilliant Strokes in certain COIN games, a Desperate Times card may be played to interrupt the normal order of play. Like normal cards, they be played for their event or Ops. 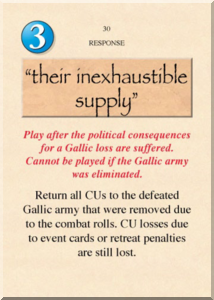 A player may cancel the play of a Desperate Times card by playing their own Desperate Times card. Desperate Times cards are removed from play after use. Normal play resumes after play of a Desperate Times card, and they may not be played back-to-back. Each player also has the opportunity to play a Desperate Times card after the fifth Action Round of each turn. When a Leader is activated, he gains 4MP and may move with up to 10CUs. MPs are spent to move through connections between spaces as shown by the Map Key. If a force moves to a space adjacent to an enemy Leader with CUs, that Leader may attempt to intercept. If successful, the enemy force is placed in the space with the moving army. If a force moves into a space containing an enemy Leader with CUs, that Leader may attempt to avoid battle. If successful, the Leader and CUs move to an adjacent space, and the moving force may continue moving. A moving force may also attempt to avoid battle if it was just intercepted. If successful, the moving force moves back to the last space entered and ends its movement. To succeed at an interception or avoidance, a Leader must roll a result less then or equal to his Tactics rating on one die. This is the Yellow number on a Leader counter. The opposing player may allow a force to automatically avoid battle. If a moving force is in a space with enemy CUs, Walled City or Tribe, and the enemy fails to avoid battle or declines to, it must end its movement and go to combat. Each player rolls three dice, and adds any modifiers as detailed by the dice charts. The higher total wins. Both players may take casualties based on the individual dice results (please note the Combat Losses table in the rulebook is incorrect; use the one on the dice charts). 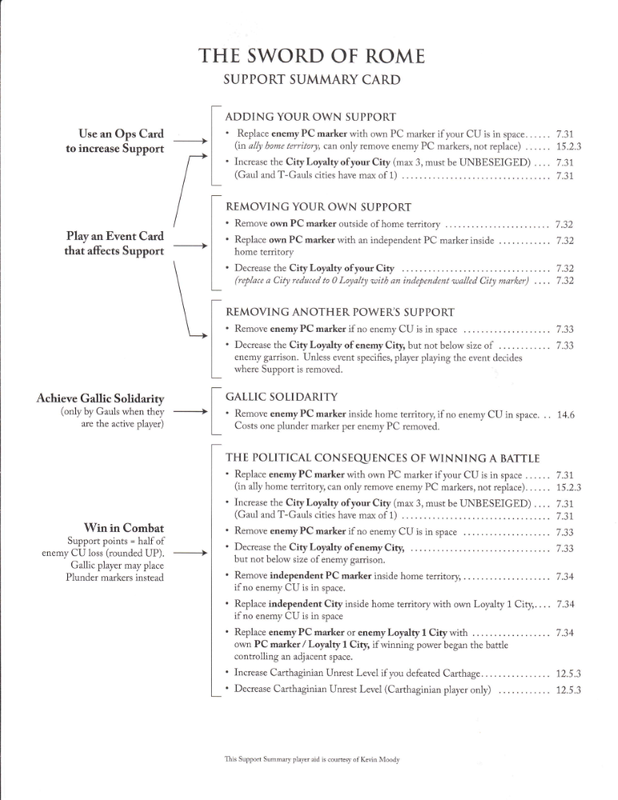 The losing player then retreats and his opponent may have the opportunity to lower his city loyalty or replace his PC markers. If a leader started his activation in a space with an enemy Walled City and at least three CUs, he may roll on the Siege table. Gaining Siege points increases the Siege level. Once the Siege Level is equal to or higher then the City's Loyalty, the siege is successful and the besieging player takes control of the City with one Loyalty. Tribes are subjugated in the same way as Cities are besieged, except that a Tribe is replaced with a PC marker and is then treated as a normal space for the rest of the game. The Active Player may propose an Alliance. Negotiations for Alliances may be done privately (through PMs or otherwise). Nothing may be traded. If the proposal is accepted, the allied players' Leaders, CUs, and spaces are considered friendly to each other. Allies may not fight each other or reduce each other's support unless the Alliance is first broken. An Alliance may be broken at any time by removing three support. Alliances automatically expire at the end of each turn with no penalty unless the players wish to continue their alliance. Please note, Alliances are between powers, not players. If a power is allied with one of the Etruscans or Samnites, the Etruscan/Samnite player is free to use the other power against the ally. The Neutral Powers are Volscii, Transalpine Gauls and Carthage. An active player may play a Neutral Power Activates card to take an action with a Neutral Power just as if he had played a card for his own power. Multiple Neutral Power Activates cards may be played by the same player, and are played in addition to his normal card. Each Neutral Power may be activated once per Action Round. Beyond the rules overview, I will post more details about each faction's characteristics. Please let me know if you have any questions about the rules! This will be a short game, so the game will end at the end of Turn 6. I've sent everyone their hands for Turn 1. Please post that you've your hand and have no problems reading it. Gauls, please choose a Player to be first player for the turn. Got it and they are readable, ohh I am officially lost.. This post will have some more details about each faction's characteristics. Refer to the faction cards in the second post for an overview of each faction's powers. 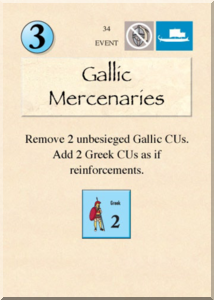 The Gauls do not gain VPs for control of enemy victory spaces, but will lose VPs if they lose control of their victory spaces. 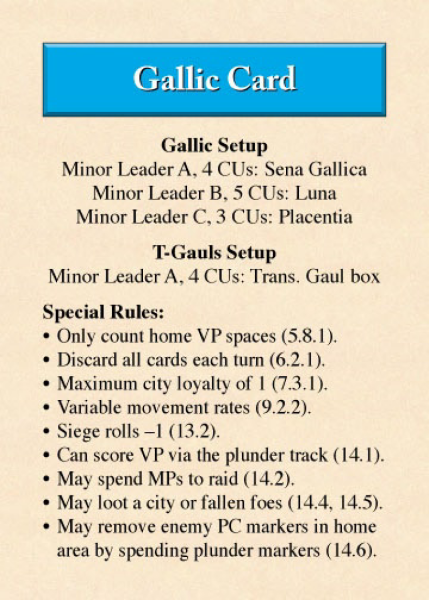 Instead, the Gauls have a number of cards that can be played for VPs after they fulfill certain conditions, such as winning a battle against a same-sized army or taking control of a number of enemy spaces. They also gain a VP whenever they fill the Plunder track. Gauls gain Plunder mostly by "besieging" enemy controlled spaces, as described in section 14 of the rules. Besides VP, Gauls may spend Plunder at any time to retake control of their home spaces, as long as their are no enemy CUs present. When a player activates the Trans-alpine Gauls, they may have the Trans-alpine Gauls gain Plunder like the Gauls. This includes Gallic spaces. Trans-alpine Gallic Plunder cancels out Gallic Plunder and vice-versa. If the Plunder track is filled with Plunder from the Trans-alpine Gauls, the Gauls lose a VP. Gallic Leaders have a variable amount of MPs based on the number of Ops used to activate them. One Op gives three MPs, two Ops give four MPs, and three Ops give five MPs. 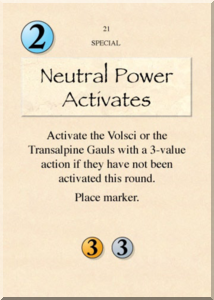 Trans-alpine Gauls are always activated with a three Op card (Neutral Powers Activate) so they also have five MPs. The Etruscans may spend a three Op card to Bribe an enemy army. This card is removed from the game. A Bribe may be used to force an enemy army to back up and stop moving after entering a space with an Etruscan army. A Bribe may also be used to allow an Etruscan army to move through an enemy army. This also prevents that army from intercepting the Etruscan army. If, at the beginning of a turn, the Etruscans do not control five or more of their home spaces, they lose their ability to Bribe for the remainder of the game. The Samnites treat all connections to the Bovianum and Aufidena tribal spaces as clear for all purposes, including movement, interception, avoid battle, and retreat. Greek named leaders are all mercenaries and do not always have the best interests of the Greeks at heart. At the end of each turn, for each Leader, the Greek player may remove that Leader from the game or remove a number of support equal to the red number on that Leader. 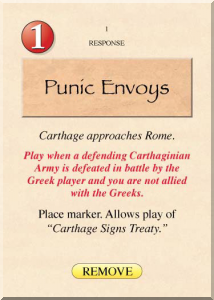 Other then Dionysius, Greek Leaders come into play through event cards (most notably Pyrrhus of Epirus). Greeks may always naval move using a three Op card. A Leader and up to three CUs may move from a Port to another Port for three MPs. Up to six CUs may be moved if moving to or from Syracusae. If Carthage has allied with Rome, Greeks must roll on the Naval Combat chart for each naval move. Unlike the other players, the Romans may receive more Reinforcement CUs over the course of the game. They receive two CUs for control of Rome and one CU for every walled city they control, regardless of who originally owned it. Named Roman Leaders are Consuls, except for the Dictator. At the beginning of each turn, both Consuls are returned to the Pool and two Consuls are randomly chosen to replace them. The same Consuls may come back. Unlike Leaders belonging to other powers, Consuls must always be with at least one CU. When a Roman army activates, instead of moving, it can remove one of its CUs to place a new walled city in the space. This new City has a loyalty of one and is treated as any other walled city for the remainder of the game. Going through the rules with the map in front of me helps. Got my hand, it´s readable. I'll be in NYC tomorrow, so I'll update on Monday. Take your time to go over everything. I may post some general strategic concerns for the factions Sunday night or Monday, if that will help. Use #14 Bomilear Withdraws for Ops to activate Dionysius. I'll take him and 6 CU from Syracuse to Neapolis using Naval Movement for 3MP, then use the remaining MP to move the lot of them to Capua. It'll gain a 0 level siege marker. Play #21 Neutral Powers Activate and activate the Transalpine Gaul's Minor Leader A. Him and the 4 CU will move to Eporedia (2), Carreum (1), and end in Dertona (1) for their 4 MP. I hope that format is ok and let me know if I did something illegal. I hope I didn't miss anything but knowing my luck I would screw up the first turn. This is fine, but you can only Naval Move if you use a 3Op card. Greeks play Gallic Mercenaries for 3Ops, activating Dionysius. Dionysius and 6CUs naval move to Neapolis and then move to Capua. Capua is placed under siege. Greek Minor Leader-B is placed in Syracusae. Greeks play Neutral Power Activates for the event, activating T-Gaul Minor Leader-A. T-Gaul Minor Leader-A and 4CUs move to Eporedia, then Carreum, and then Dertona. Rome is now the active player. As a note, the Samnites have Minor Leader-B off-board that has the same stats as their Minor Leader-A. Romans have two Minor Leaders off-board. They have an Initiative of 2 and a Tactics Rating of 1. Everyone but the Romans have at least one named Leader that can enter play permanently through an Event. 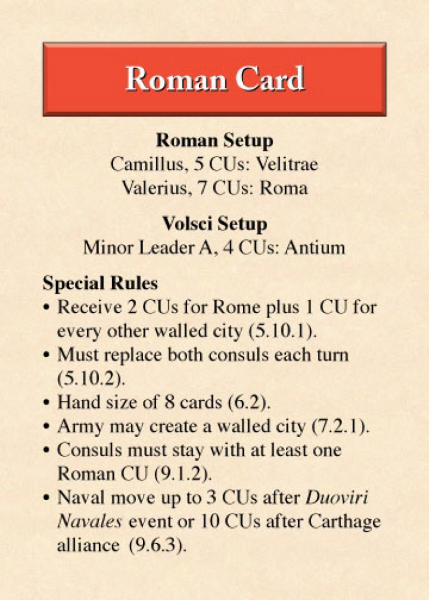 The Romans, in addition to their Consuls, have the Dictator, who enters play through an Event but leaves play at the end of the turn. 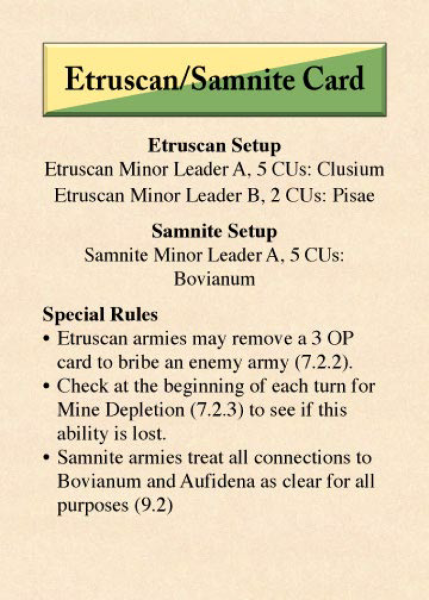 Campaign - Etruscan/Samnites and Greeks have one Campaign card in their deck, and the Romans have two. 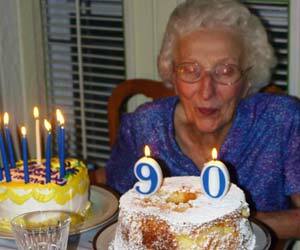 Gauls have none, because planning is for losers. A Campaign card allows that power to activate two leaders. One of the two leaders may be an ally's, if they give permission. The first leader must activate and finish its move before the second leader is activated and moved, unless attempting a Coordinated Attack. Since it's a 3Op card, naval movement may be used, but only by one leader. The same Leader may not be activate twice, unless it's a Roman Leader and the second activation is used to found a colony. For more details, see rules 9.5. Cards that mess with the other players - Everyone has cards to mess with everyone else. Some powers have more cards that mess with a particular power then the others, but everyone's got at least one for each power. Cards can remove Support or CUs. There are also Response cards that can mess with combat rolls. Importantly, these cards can be played anytime their conditions are met. 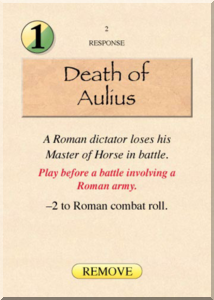 For example, the Etruscan/Samnite card Death of Aulius may be played before any combat involving a Roman army, not just a combat between Roman and Etruscan/Samnite forces. Reshuffle - Each deck has a card that says "Reshuffle" on the bottom. If that card is played or discarded for any reason, that power's discard pile will be reshuffled into its deck at the beginning of the next Draw phase. 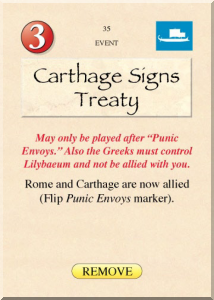 Carthage and Rome - Rome may become allied with Carthage by playing Punic Envoys and then Carthage Signs Treaty. This gives Rome a number of benefits as described in rules 18. Samari - check your PMs. Learning the game and clarifying some rules please bear with me. Per PM, Romans play Neutral Power Activates to activate Carthaginian Hamilcar. Hamilcar and 7CUs naval move to Messana, placing it under siege. 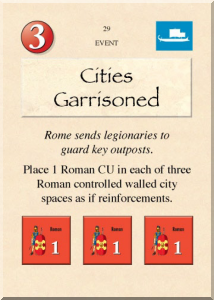 Romans play Cities Garrisoned for the Event. 1CU is placed in each of Sutrium, Narnia, and Rome. 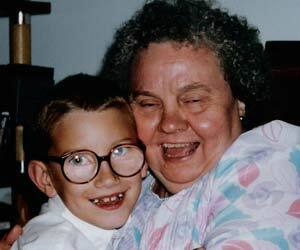 If there are any Responses to these actions, please play them now. Gaul is now the active player. inside the City and which aren´t, right? Yes. When an enemy army enters a player's space with a Walled City, that player may choose to have up to three of his CUs and any number of Leaders be inside the city. If all of that player's CUs are now in the city, the enemy army may continue movement. (rules 9.3.1) If an army remains outside the Walled City, that army must choose to fight or attempt to avoid battle. Response cards may be played whenever their conditions apply. I'll send you a PM to clarify. Sorry for the delay, my company has sent me to another city for training and I can only check this on my phone. Should be over tomorrow. Very well. Let them hide in their walls. - play a Neutral card to activate the Volsci and place a CU in Antium. -Play another Neutral Power card to activate the Transalpine Gauls, move the to Eporedia and raid. Stopping to let the Gauls react if they want. Edit: the Transalpine Gauls had already activated and I'm dumb. 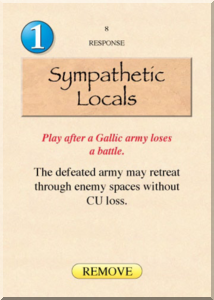 Gauls play Sympathetic Locals for 1Op to activate Minor Leader-B. Minor Leader-B and 5CUs move to Pisae. Etruscan Minor-Leader B and 2CUs hide in the city. Gauls Minor Leader-B stops movement and places Pisae under siege. Etruscan/Samnites is now the active player. - play a Neutral power card to activate the Volsci and place a CU in Antium. This is fine, except the T-Gauls can't be activated again until the next Action Round (i.e. Greeks turn). Edited last post. New move. - Play a second Neutral Powers Activate card to march my Etruscan army to rescue Pisae. Besieged dudes will join the battle. Gauls, would you like to attempt to intercept the Etruscan army in Faesulae? If not, would you like to attempt to Avoid Battle? If that doesn´t work, I would attempt to Avoid Battle. Re-reading the intercept and avoid battle rules, intercepting into an enemy controlled space with no friendly CUs has a +1 drm, so that's guaranteed to fail. A failed Avoid Battle roll, will also result in a -1 drm to the subsequent battle roll, so would you still like to attempt to avoid battle? Sorry. "They are too far away, sir"
Considering my Chances? Not really. Bah. I´ll take my chances. Let them come. "Men! Tonight we dine on Etruscan Blood!" Blood is icky and Gauls are gross. 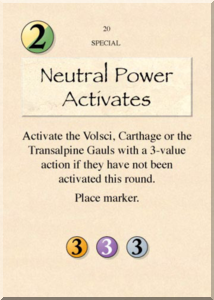 Etruscans/Samnites play Neutral Power Activates for the event, activating Volsci. Antium is reinforced with one CU. Etruscans/Samnites play Neutral Power Activates for 2Ops, activating Etruscan Minor Leader-A. Etruscan Minor Leader-A and 5 CUs move to Arretium, then Faesulae, and then Pisae. Gauls decline to Avoid Battle. Etruscan CUs in Pisae join relieving force for 7CUs against Gaul's 5CUs. Etruscans receive +1 drm for force ratio, +1 drm for superior leadership, and +1 drm for fighting in a friendly-controlled space, for total drm of +3. Etruscan/Samnites may add/remove two Support for Political Consequences. Replace the losing power’s PC marker in a space free of enemy CU with the winner’s PC marker if the winning power began the battle controlling an adjacent space. mean I can flip Bononia to Etruscan control, given that I control Faesulae? If so, do it, whether it costs me 1 or 2 Support. If I can't do that (or if it only costs me 1 Support), increase the loyalty of Tarquinii and Pisae, in that order. Etruscans take control of Bononia and increase loyalty of Tarquinii by one for Political Consequences. Per PM, Gauls play "their inexhaustible supply" as a Response, returning 4CUs to the defeated army in Luna. Greeks is now the active player. Gonna play Bomilcar Withdraws for 2 Ops to activate Dionysius and roll on the siege table for Capua. Should be it for my turn I believe. Sorry about the delay yall, I must have unbookmarked this thread. I'll be more prompt in the future.